Because you know you've always wanted to know. Okay, technically, it's 'deworm' but no one says that. Everyone says worm. Cause we're horse people. And we're lazy. So here's what you do. Horses need to be wormed every 6-8 weeks. You need to rotate wormers. 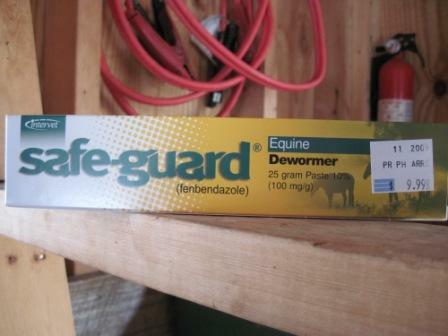 This means you don't buy the same wormer each time because horses can build up a tolerance. So you switch off. Most horse owners like to switch off between Strongid and some other brand every few times. So if you plan to take pictures while you worm, pick the horse that is calmest. Otherwise you may end up breaking your camera. My horse, Phoenix, has always been an idiot about worming. 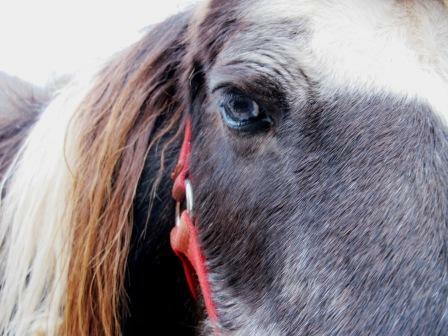 So the pony, Harriet, was chosen to be my model. Check out the wary, less-than-thrilled, look in her eye. Horses don't generally like being wormed. So you will want to prepare your supplies beforehand. This basically just involves opening the box (don't let the horses see you doing this!). 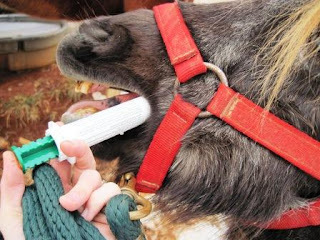 Then take out the wormer. You will worm your horse based on his/her weight. Harriet weighs approximately 500 pounds. 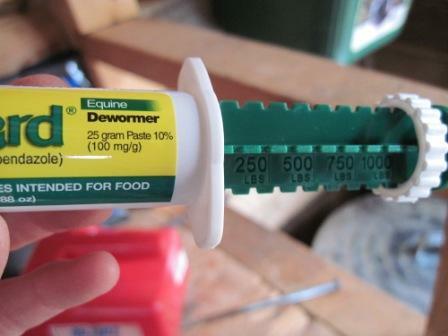 So you just dial up to the weight on the dewormer. Or in this case, dial down. Now is when you've got to be sneaky. If they see it, it's all over. Once you've caught your victim horse, then you can pull out the goods. Now one trick I've learned with Phoenix, who hates all things that begin with the letter W, you can be a little sly by gently sliding your finger in the corner of the horse's mouth as though you were putting in a bit. Then while the horse is mouthing your finger like, "What's this?" you can sneak the wormer in. SQUEEZE! And do it FAST! Dude, they really hate this stuff. Oh yeah, and did you wear old clothes? Because you're likely to get yellow slime tar stuff all over as the horses try to spit it out. Alright, all done. Now you're good for another 6-8 weeks. Don't forget to stop by tomorrow for Memory Lane Friday. This week's theme is 'A Room'. You can write about any room you remember well from your childhood. Ahhh, fun times! That "wonderful" peanut butter-textured stuff. You have it "easy" with Harriet! ;) She's short and calm. First horse I ever wormed was Pitufo, a tall polo pony who'd raise his head higher and higher as I continued to push the plunger down. The fact that the stuff is gooey doesn't help you when you're trying to do it fast, right?